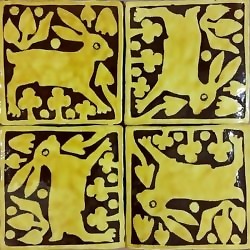 Inlaid, traditional honey glazed Medieval Tile designs created in earthenware and slip clays. Decorative patterns researched and carved into wooden pattern blocks which I use to stamp into clay and fill with white clay slip. After careful drying, I carve away the extra slip to reveal the detailed design. Fired and glazed with a deep yellow glaze, the tiles are then ready to decorate homes and interpret historic settings and museums. Historically accurate replica Medieval Tiles, researched and reproduced for individual homes, Museums, Societies, Churches and Cathedrals. Demonstrations, workshops and courses given to all ages and abilities, clients include English Heritage, National Trust, Cadw, SPAB and The Weald and Downland.